Since there is a major interest for collaboration between rare diseases researchers in Europe and beyond, rare diseases have been defined as one of the core priorities of the Maltese presidency of the Council of the EU. In this context, a two-day workshop titled Integrating Research and Healthcare for Rare Diseases took place in Malta on 20 and 21 March 2017. The aim of the workshop was to discuss opportunities for structured cooperation in rare diseases research, tools, and healthcare at the EU level, as well as ways of adapting existing programmes by scaling them up and integrating them under the same umbrella, thus creating a sustainable ecosystem of knowledge generation. To emphasise the high-level nature of the workshop, it was run in parallel to the informal meeting of EU Ministers of Health held in the Grandmaster’s Palace. The only infrastructure present in Malta, BBMRI-ERIC was represented by Director General Jan-Eric Litton, who presented the research infrastructure and its contribution towards services for the rare diseases community. He also gave a presentation on the importance of a code of conduct regarding health data in the context of the upcoming General Data Protection Regulation. Photo: The workshop participants. 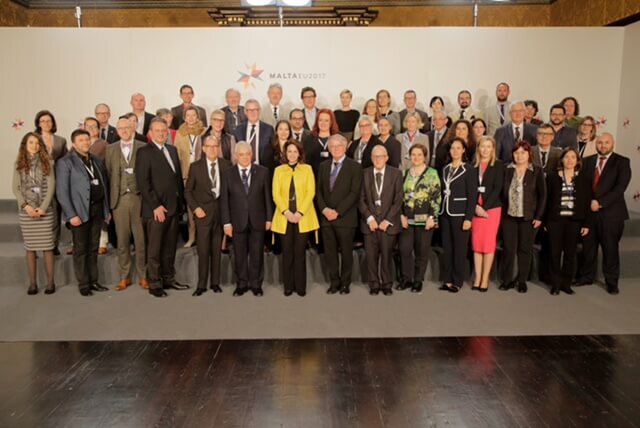 The meeting was hosted by the Maltese Prime Minister’s spouse, the Honorary Patron of EURORDIS (in the yellow jacket), standing next to Director General Jan-Eric Litton.